Kelley Joiner. He'll be here in the fall I believe. His tape is impressive and I wouldn't be surprised if he has legitimate sub 4.4 speed. That works for me as I also enjoy food. 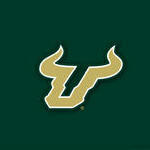 So what do you say the terms are, Atkins is a starter during his time at USF you win, if he isn't you win? Or do you want to do it stats based? Like he cracks the top 6 in receiving for a whole season you win, he doesn't I win? Or some other kind of stat based requirement. Oh yea, I have a theory on Sean Atkins. When I first saw this photo, I "judged a book by its cover" lol I was surprised how much buddy can fly. I figure he gets judged by his appearance every where he plays and has a chip on his shoulder. I felt that same way about Johnny Ford last year. He has more 2 prove b/c of his height. He has impressive stop and go ability. If he was 6ft+ he would have gotten more attention no doubt. I feel great about our WR's.